Takata CEO Shigehisa Takada, pictured at Monday's press conference: “KSS is the ideal sponsor as we address the costs related to airbag inflator recalls, and an optimal partner to the company's customers, suppliers and employees." TOKYO -- Japanese airbag maker Takata Corp. has filed for bankruptcy protection in Japan and the U.S., succumbing to the weight of the world's biggest automotive recall. Takata said it would sell key assets to U.S. supplier Key Safety Systems. Key Safety, based in based in Sterling Heights, Mich., said separately it would buy “substantially all” of Takata’s global assets and operations for C $1.7 billion ($1.59 billion). Transport Canada on Monday couldn't immediately say how many vehicles in Canada are affected or whether there had been any deaths or injuries associated with the inflators. Although, none had been reported to date. In February, Takata pleaded guilty to wire fraud charges in the United States for systematically withholding information about the defects and manipulating inflator test data. In January, a federal grand jury indicted three former Takata executives for criminal wrongdoing in connection with the safety defect. A month later, Takata agreed to a C $1.32 billion (US $1 billion) criminal penalty. 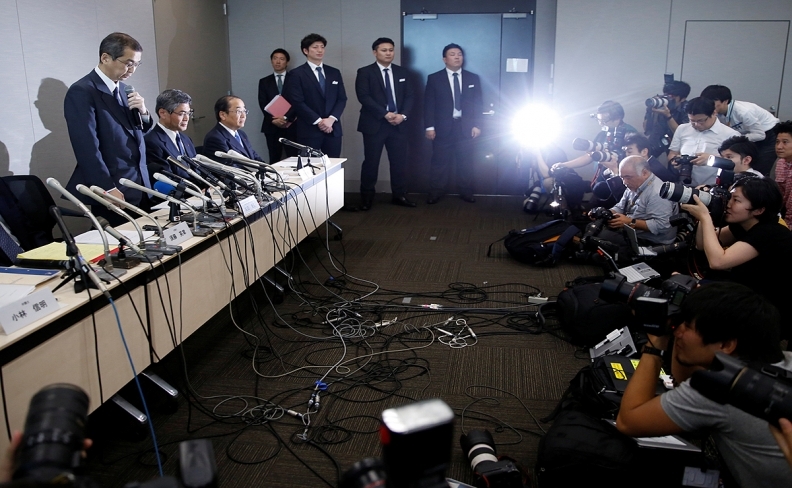 Takata executives, led by founding family scion and CEO Shigehisa Takada, bowed in apology for the fall from grace during a Tokyo news conference to outline the bankruptcy. With liabilities mounting and finances collapsing, the supplier had no choice but to sell assets for cash, Takada said. Proceeds of the sale will be put toward paying down the liabilities, he said. "If things are left as is, we are aware of risks that we may not able to raise fund and to continue stable supply of products," he said. "In light of the management environment we face, the state of negotiations with the sponsor candidate and carmakers, and the external expert committee's opinion, we have decided today to file for bankruptcy protection." But some analysts put potential liabilities as high as C $13.2 billion (US $10 billion) for ongoing recalls, penalties and settlements. Another report, from Tokyo Shoko Research Ltd., said Takata's total liabilities stand at 1.7 trillion yen (C $20 billion). The C $1.7 billion (US $1.59 billion) from Key Safety would go only so far in covering such liabilities. Takata also will receive a C $300 million (US $227 million) lifeline from its main lender, Sumitomo Mitsui Banking Corp., in the form a debtor-in-possession financing. As part of its U.S. settlement, Takata agreed to establish two independently administered restitution funds: one for C $1.12 billion (US $850 million) to compensate automakers for recalls, and a C $165 million (US $125 million) fund for individuals physically injured by Takata’s airbags who have not already reached a settlement with the company. Meanwhile, 17 automakers -- including Honda Motor Co., Toyota Motor Corp. and BMW -- were listed as unsecured creditors with unknown claims related to recalls and indemnification, according to the filing. Additional litigation claims, which have not been estimated, included those from class-action plaintiffs in the U.S. and Canada and the attorney general of the U.S. Virgin Islands. The National Highway Traffic Safety Administration has an C $238 million (US $180 million) claim for fines and penalties. "KSS is the ideal sponsor as we address the costs related to airbag inflator recalls, and an optimal partner to the company’s customers, suppliers and employees," Takada said in a statement. "Throughout this process, our top priorities have been providing a steady supply of products to our valued customers, including replacement parts for recalls, and a stable home for our exceptional employees. This agreement would allow that to continue." The family controls the supplier through TKJ Corp., a holding company of which Shigehisa has been listed as president and his younger brother Hirohisa has been listed as a director. But Takada said that model was no longer viable. Takata warned in bankruptcy documents that if it does not complete the restructuring by March and complete payments owed under the deal, the Justice Department could withdraw the plea agreement and seek higher penalties. Takata was negotiating with other potential buyers -- including market leader Autoliv Inc. of Sweden -- months before reaching a deal with Key Safety. Dustin Walsh of Crain's Detroit Business contributed to this report, along with Bloomberg and Reuters.